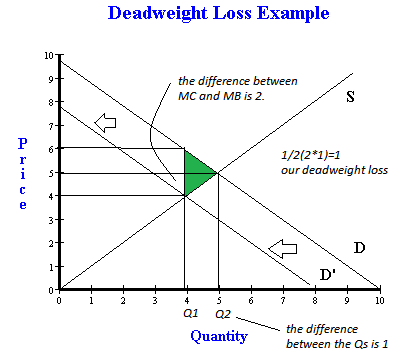 How to calculate deadweight loss; easy 4 step method - FreeEconHelp.com, Learning Economics... Solved! 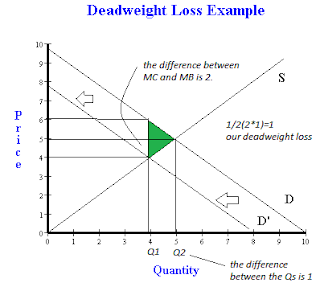 Deadweight loss occurs when an economy’s welfare is not at the maximum possible. Many times, professors will ask you to calculate the deadweight loss that occurs in an economy when certain conditions unfold. These conditions include different market structures, externalities, and government regulations. Review this past post for more information on deadweight loss. 1) Identify where what amount of a good or service is currently being produced (we will call this Q1). 2) Identify where the societal optimum should be and figure out the quantity produced in this equilibrium (should occur where society’s MC = society’s MB, we will call this Q2). 3) Because of the nature of the MC (supply) and MB (demand) curves, we should get a triangle shape, with the two curves (supply and demand) crossing at Q2. This triangle shape will have a base (the difference between Q2 and Q1) as well as a height (the difference between MC and MB at Q1 (most common the difference in prices)). 4) The equation for the area of a triangle is ½(base*height). We know what the base and the height are in this scenario so we can calculate the deadweight loss by figuring out the area of this triangle: ½(difference between Q1 and Q2 * the difference between MC and MB at the wide end). Now let’s go through an example to demonstrate how these four steps can be used to actually calculate the deadweight loss. Looking at the example above, we see that equilibrium in this market occurs at a price of 5, and a quantity of 5. If we have a tax imposed on the economy, then we see equilibrium quantity go down to 4. This means that our Q1 is 4, and our Q2 is 5. So the base of our deadweight loss triangle will be 1. The difference between supply and demand curve (with the tax imposed) at Q1 is 2. So our equation for deadweight loss will be ½(1*2) or 1. So here, when we calculate deadweight loss for this example, we get a deadweight loss equal to 1. Summary: Deadweight loss is generally triangular shaped and will be located between the two equilibrium quantities. Remember that the equation for a triangle is 1/2(base*height). That was something new to know. Thanks for a good explanation. I also suggest you to have a peek at this interesting source . Your graphic explanation was very clear. Thanks for exlaining. How long does the keto flu last? The keto flu, aka carb withdrawal, generally kicks in at the 24- to 48-hour mark. Symptoms typically last from a few days to two weeks, and up to a month at most. I think we can check all things out from vibro shaper avis and how this could be at Mike geary tout sur les abdominaux with la diete 3 semaines for better results. Let's go with la diete 3 semaines and for la diete 2 semaines for good results.